Hi everyone! Just a reminder that for those of you attending the 55th, we will need the reservation money of $65pp in hand by August 1, 2014. Even though we have a lot of positive responses, we only have 9 people paid to date and will need to make deposits and payments. Please help make our job easier. (See original detail letter with info form attached). Please complete the form on the bottom of the letter and return it with a check for $65.00 per person so that it is received no later than August 1, 2014. Attendees will have their names held by the committee members at the door. Unfortunately, no dinners can be purchased at the door. Please make checks payable to “Weymouth High School - Class of 1959”. All forms and checks must be mailed to Dot Miller, P.O. Box 757, East Dennis, MA 02641. Additional information may be available on the class web site at: www.whs1959.com. Your reunion committee has planned a dinner buffet to commemorate our 55th reunion at the Radisson Hotel in Plymouth on September 20, 2014. We analyzed your survey suggestions and the consensus was to have a venue as we had for our 50th celebration. Since the hotel meal prices have significantly increased in five years, we have tried to keep the ticket price reasonable by eliminating a DJ and hospitality suite. However, there will be ample opportunity to socialize with classmates during the cocktail and dinner hours. Here are the details for what promises to be a great 55th Reunion. Cocktail Hour (Cash Only) and Dinner Buffet—From 6:00 P.M. to 11:00 P.M. The price for dinner is $65.00 per person. Please note that the price has been reduced thanks to the generosity of classmates who have made contributions. We will be cheerfully accepting contributions from any who wish to help. 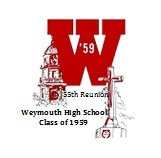 This will be a distinctly low pressure fund raising operation but in the spirit of class camaraderie, checks can be made out to “Weymouth High School – Class of 1959” and sent to Dot Miller, P.O. Box 757, East Dennis, MA 02641. 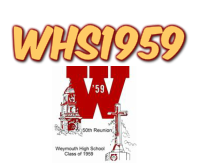 A limited number of rooms have been reserved for the reunion on September 19th and 20th under the designation, WHS-Class of 1959. These are available on a first come-first served basis. You should call the hotel directly for reservations. The hotel telephone number is (508) 747-4900. In order to take advantage of the group rate ($159.00) per night, you must make your reservation by telephone and identify yourself as a member of WHS-Class of 1959. The reservation cut-off date for the group is August 19, 2014. The hotel’s address is 180 Water Street, Plymouth, MA 02360. Please complete the form on the bottom of this page and return it with a check for $65.00 per person so that it is received no later than August 1, 2014. Attendees will have their names held by the committee members at the door. Unfortunately, no dinners can be purchased at the door. Please make checks payable to “Weymouth High School - Class of 1959”. All forms and checks must be mailed to Dot Miller, P.O. Box 757, East Dennis, MA 02641. Additional information may be available on the class web site at: www.whs1959.com. We just got off the phone with the Radisson to confirm our date for the 55th. The contract is in the mail to sign. Hope this is agreeable to everyone. Can you believe it has been four years since our 50th reunion? We, the Reunion Committee, are wondering what your thoughts are about a 55th. We are beginning to plan for the 55th and need your help to proceed. We have to decide on the date, venue, length, event, activities, etc. We like the idea of a hotel but that setting is expensive--even in Plymouth. There is a concern that with most of us now retired and the weak economy many people would find the cost too great. There are minimums to meet and there would be a healthy facility cost on top of the meal plus the extras as a policeman, DJ ,centerpieces etc. We also have to figure in the mailing costs for those whom we do not have e-mail addresses. A hotel would need to be booked at least a year ahead. Preference would be to have something near a hotel but let classmates make their own accommodation arrangements if they choose to stay overnight. It could also be an informal meeting place for our classmates. Maybe the best compromise is a lunch in Plymouth and let those who want a weekend, book their own hotel and have informal get-togethers, such as dinner, over the weekend. 4. Would you come? How many? Would you attend if there were one official function (dinner or lunch) and a designated hotel for the night before and the night after? That would allow for opportunities for two days of informal gatherings. This is important for us to know a preliminary count-makes it MUCH easier as well as any minimum concerns. 5. Any other suggestions? Anyone like to help? Hope you are enjoying the summer. We look forward to hearing from you.